So first to Ply; those of the disco pizza oven and fluffy dough bases. 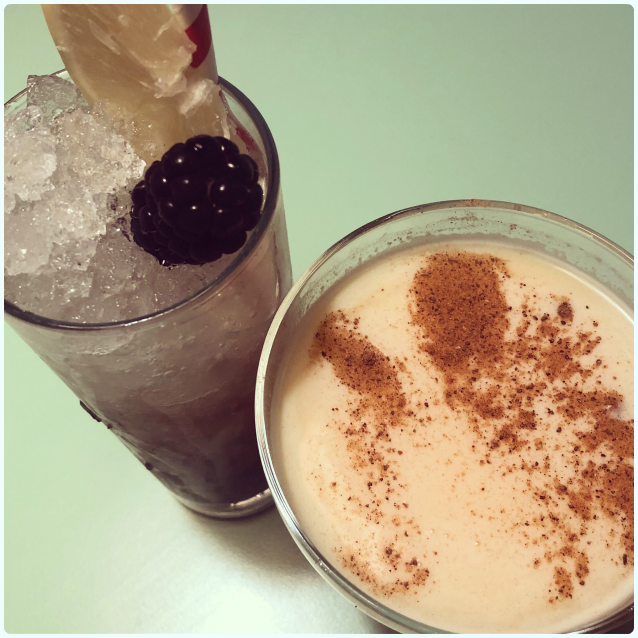 Launched just last week, are their festive cocktails. They were still being perfected, so we got to be guinea pigs. Not a problem my friends. 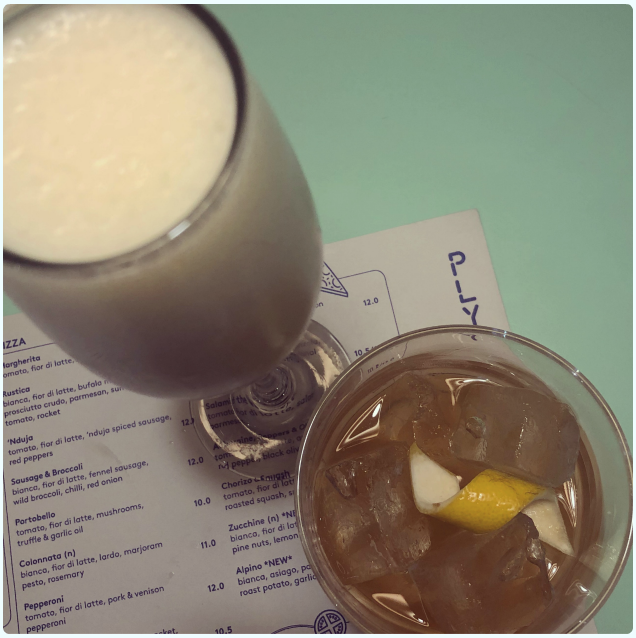 Dolce Vita - pannetone infused rum, spiced syrup, orange and egg: It's basically a Christmas egg custard in liquid form. Lovely bit of nutmeg on top to warm those cockles and get you in the mood for some festivities. Better than freezing your bits off in some crowded market sipping hot muck from a mug. BlackBerry Messenger - a blend of rum, prosecco, blackberry, orgeat, ginger and honey: Refreshing yet still has that delicate warmth from the ginger. White Chocolate Snowball featuring a flurry of vodka, white chocolate liqueur, prosecco and milk: Only for those with sweet teeth (not tooth). This is like a fizzy milkshake, and not for the faint hearted. Roast Peach Old Fashioned - roasted peach infused bourbon, honey and sage: By far Phil's favourite. We both thought the peach may be a little over-powering, but it's actually very delicate, and worked beautifully with the honey. And so to the carbs my loves. This Sunday saw the launch of Pasta Paul’s Super Soundtrack Sunday, 'bringing the beats whilst Ply serves up the best in bottomless brunch'. Basically, this is unlimited pizza (once you've scoffed your first one), and bottomless Bloody Marys or prosecco, for an hour and a half. It's £25, and is served between 12-6pm every Sunday. We were utter lightweights and ate one pizza each. I had the poorest of form, and made Phil eat some of mine! (Rings bell...) Shame! We did however try two of the newest items on the menu. Brunch Pizza - crispy pancetta, portobello mushroom, sausage, egg and mozzarella with a tomato base: A full English on a pizza. Nice sausage. Alpino - bianca, asiago, panna, speck, spinach, roast potato, garlic with a white base: I love white based pizzas, as I find tomato sometimes distracts from the flavour of the topping. The Alpine has thinly sliced potatoes which crisp beautifully in the inferno style pizza oven. Absolutely love Ply. I've never had a bad pizza from there, and the staff are always the right level of chatty. 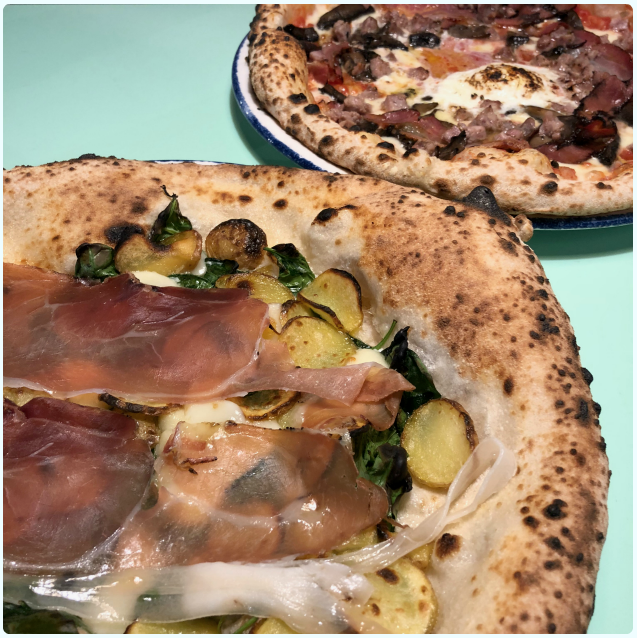 Our lovely waitress was getting well giddy about her post shift roast, and had we not just gorged on pizza, we would have been very tempted to join her! We're all about the gravy. Go here for a chilled afternoon of eclectic tunes, pizza, fizz and some cracking winter warmers. Disclaimer: I was invited to Ply to try their new offerings. Let's face it, I'd have gone anyway! They did not threaten to throw me in the pizza oven if I said anything nasty, and we did not gatecrash our waitress' roast. Too far. And we were full. About bloody time really. 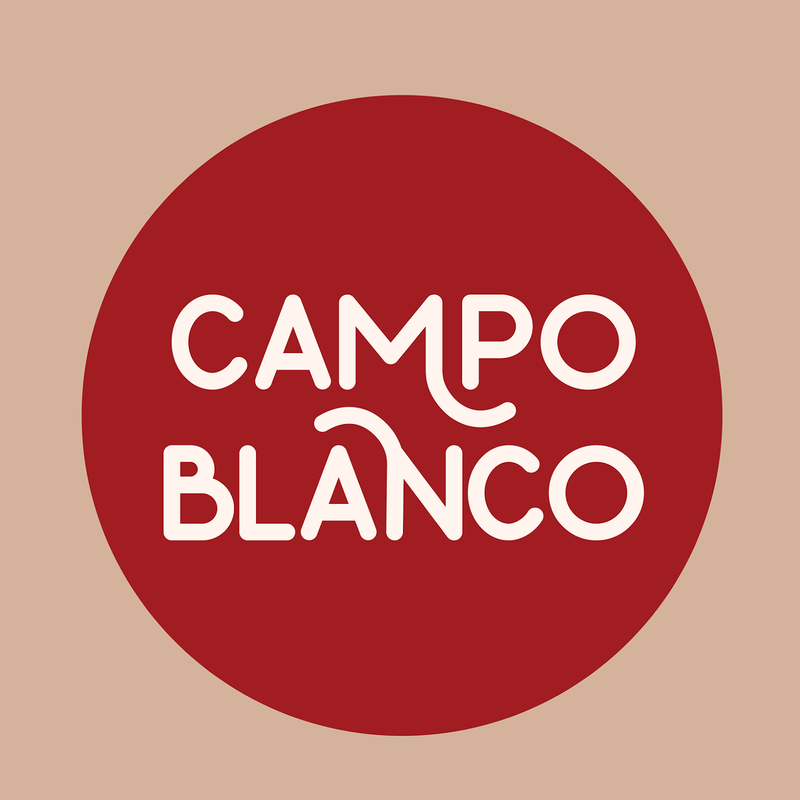 We shamelessly stalked the opening of Campo Blanco after a summer of whinging 'we need a good tapas place round here'. Then one day we saw a sign go up, there was activity inside, and we were poised. A right little temptress on Instagram, they were driving me crackers! Then on Sunday we finally found ourselves spending a damp afternoon sampling their wares. 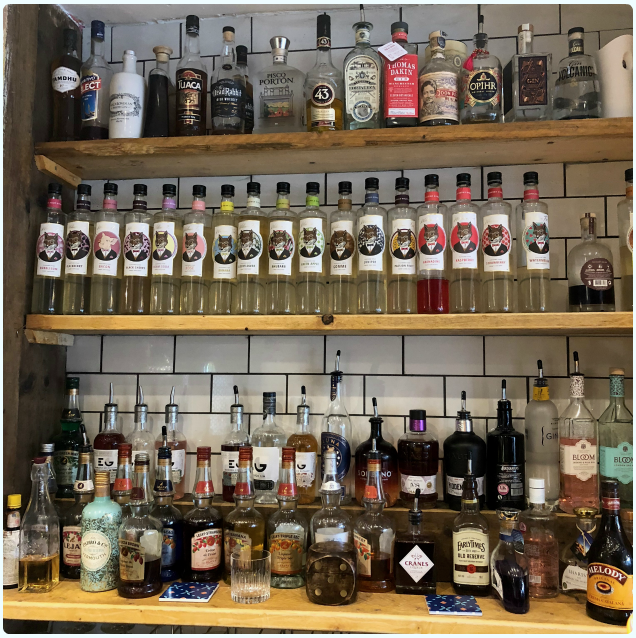 We walked in to see a well stocked bar, packed with some unusual bottles and an eager barman. 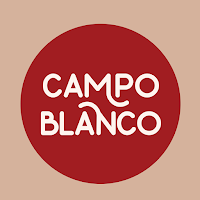 I got chatting to Aaron, who co-owns Campo Blanco with his fiancé Faye Jennings, who told me all about their future plans and how they've strived to make it as inclusive as possible. Gluten free-ers, veggies and vegans worry not, for you will be fully catered for. He talked passionately about their organic wines, and how they make families welcome whilst not interrupting couples wanting some peace. 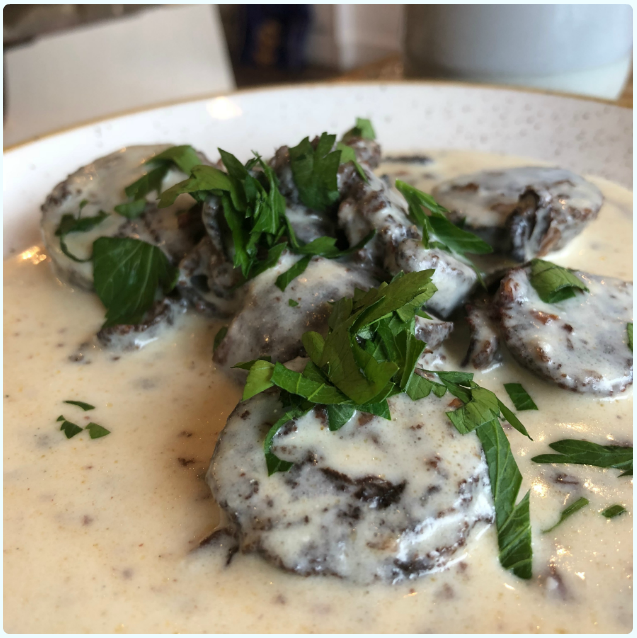 The menu is extensive without feeling like you're faced with a wall in a Chinese takeaway, and once agin provided the age old conundrum of 'what in the hell do we order?' I think we did alright you know. 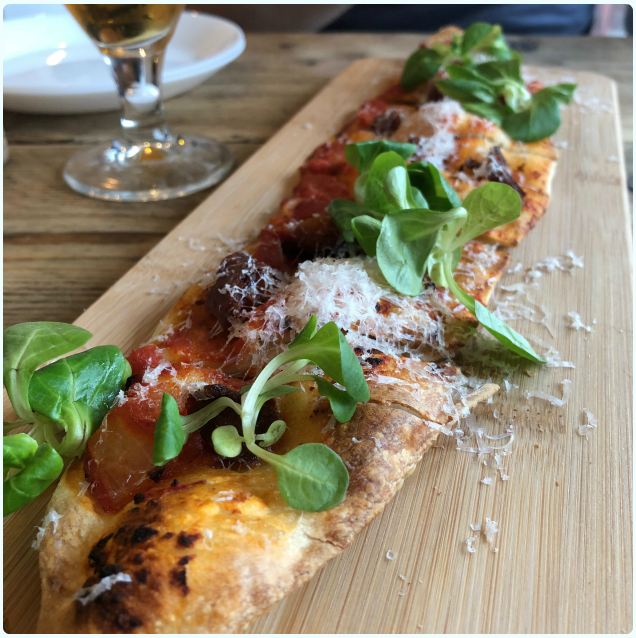 Flatbread with manchego and chorizo: Thin, crispy bread with cheese and meat, which I really wish we had saved to mop up sauces. Note for the future. Or just order more. Mussels - steamed green shell mussels in a green chilli and parsley sauce: These were Phil's choice, as you know I don't do shellfish as a rule. I did however steal some of that sauce, which was absolutely delicious. He demolished these pretty quickly. 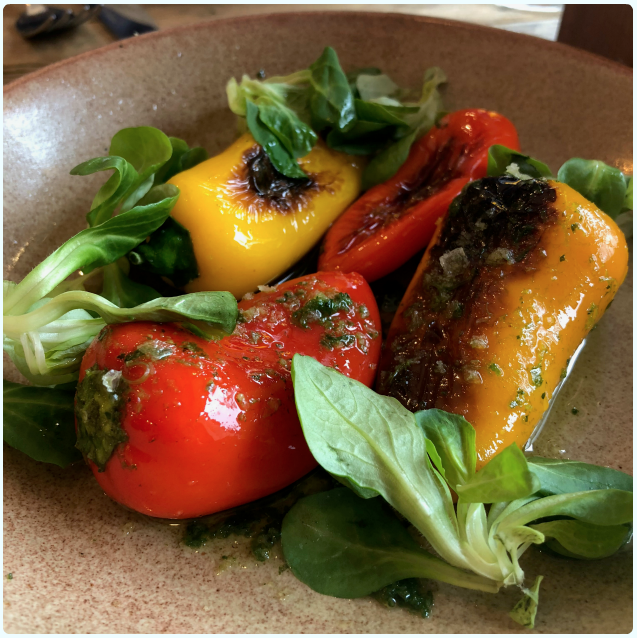 Fried peppers - pan roasted baby peppers drizzled in green mojo (homemade green sauce made with coriander, parsley, garlic, chilli, shallots and sherry vinegar): A lovely piquancy to these. Could have been a little softer, but still great flavour. 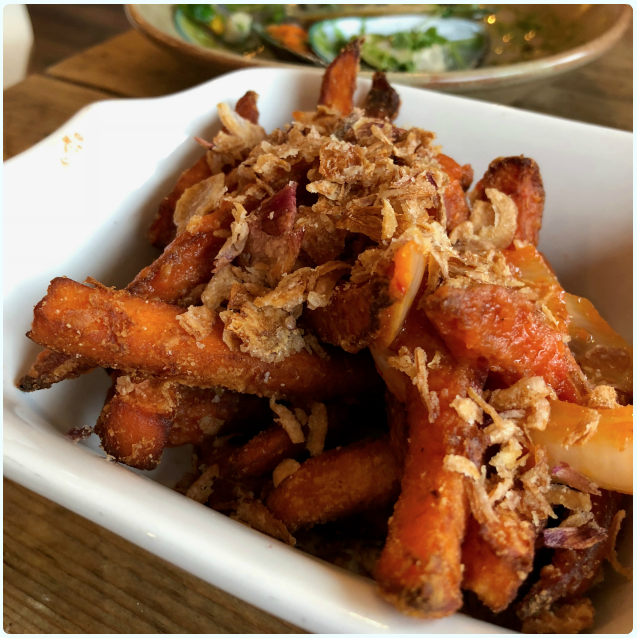 Sweet potato fries with bravas sauce and fried onions: Poor picture, great dish. We both loved the large pieces of onion on these. Great for dipping in sauce if you've been greedy and eaten all your bread early doors. 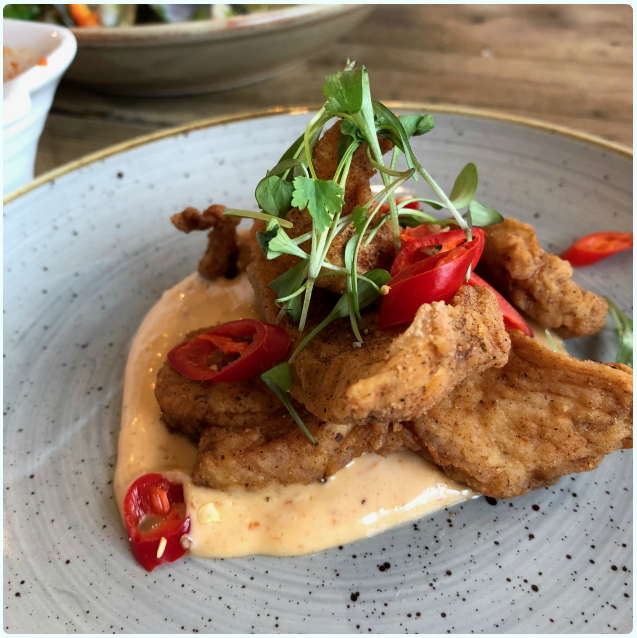 Crispy chilli chicken - fried chicken thighs coated in a homemade spice blend served with chillies, spring onions and chipotle mayo: Imagine if KFC was actually good, and didn't leave you feeling dead inside. Bingo. 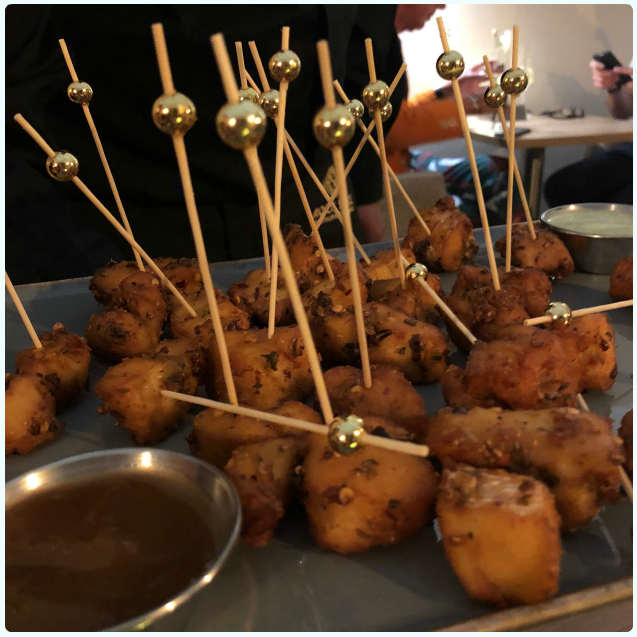 Not a smattering of grease, these were beautifully spiced and that chipotle mayo was top notch. 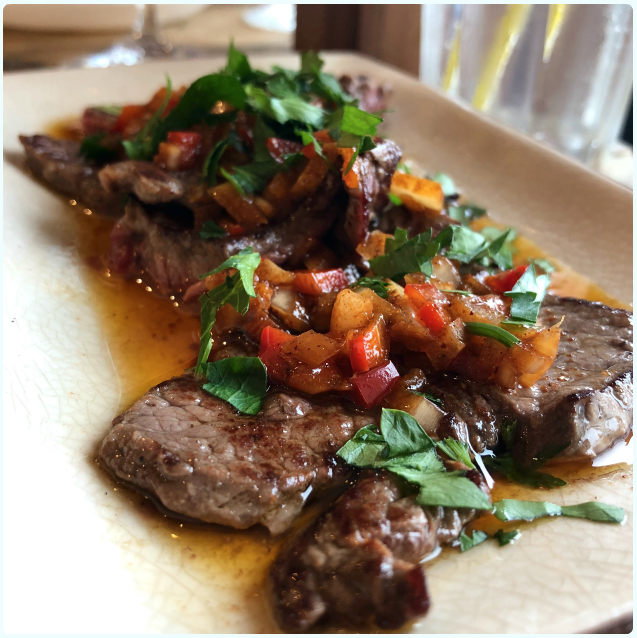 Steak medallions - tender medallions of beef, drizzled in chimi churri (homemade green drizzle with pepper, onion, olive oil, garlic, smoked paprika and ancho chilli): One of my two favourite dishes. Zingy, fresh chimi churri was utterly perfect on the tender beef. Black pudding and blue cheese - traditional Spanish black pudding served with a blue pico cheese sauce: My other favourite. That sauce is unbelievable. If you don't like blue cheese, do not fret. It's incredibly delicate, and is the perfect partner to the local black pudding. I must insist that you order this. 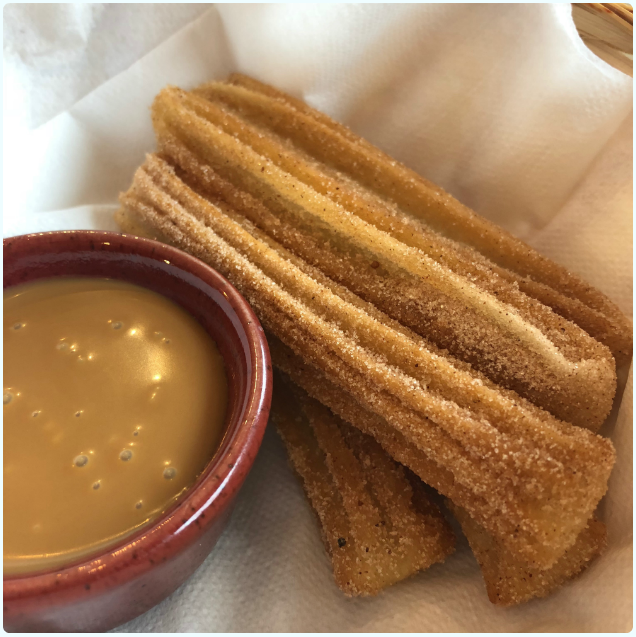 Churros with dulce de leche: Churros have to be ordered if they are on the menu. It's essential. I have to say, these are some of the best churros I've ever had, and this greedy girl has eaten a lot. They had the balance of crisp exterior and soft interior just right. We had such a lovely time at Campo Blanco that we are already planning to go back for brunch, and another trip for cocktails in the evening. 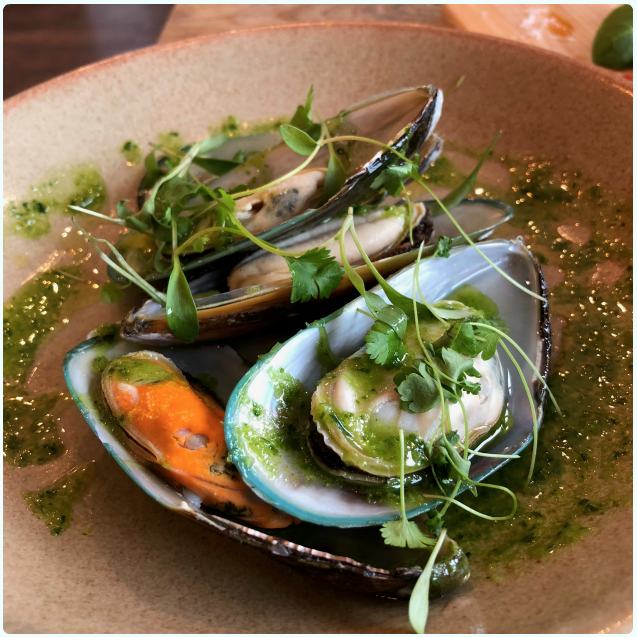 I loved the passion of everyone involved, from the ideas being cooked up by Aaron and Faye, to their chef wanting every dish to look just perfect. They are nice people living their dream, and taking us along for the ride. I can't wait to see what they have up their sleeve in the future, as this seems to be an ever evolving venture. Go here for a relaxed lunch, or enjoy the hustle and bustle of a busy evening service. Either way, you're going to eat some great food! I'll report back on that brunch. 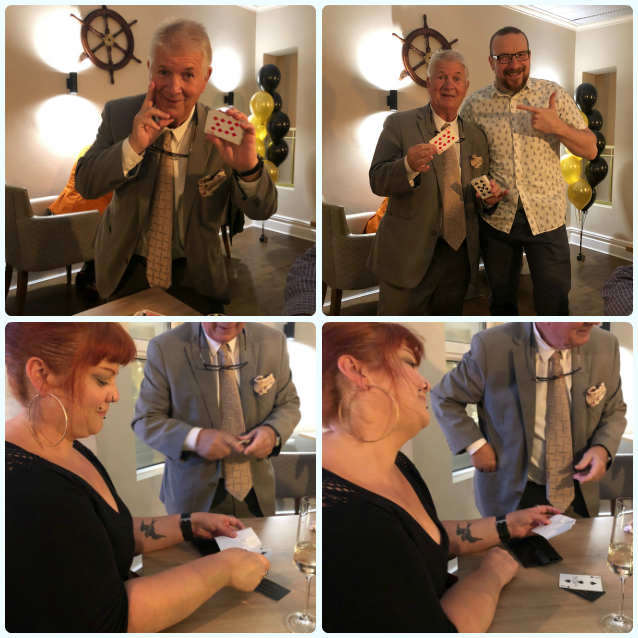 Bubbles, lots of lovely food, good company and even a bit of magic. Sounds like a fun filled Friday evening to me. 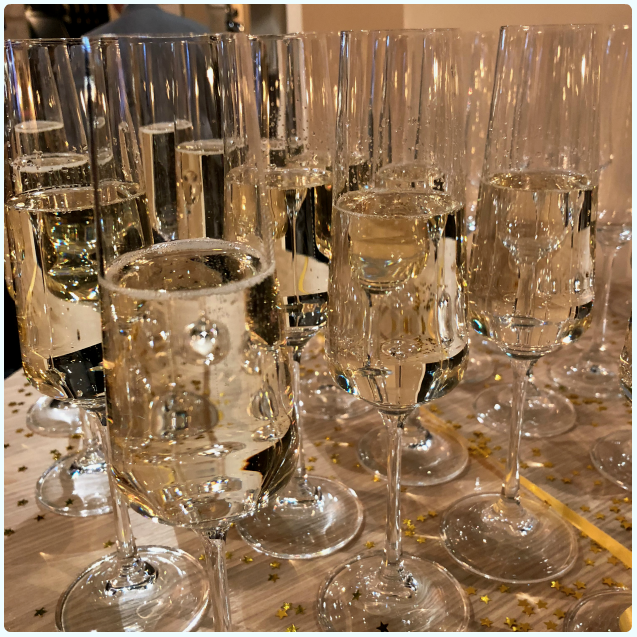 Bubbles were flowing on arrival, and we soon spotted blogging pals Charlie and Simon (Gin Fuelled Blue Stocking), and Carl and Stephen (The Gourmet Gays). So to the food. 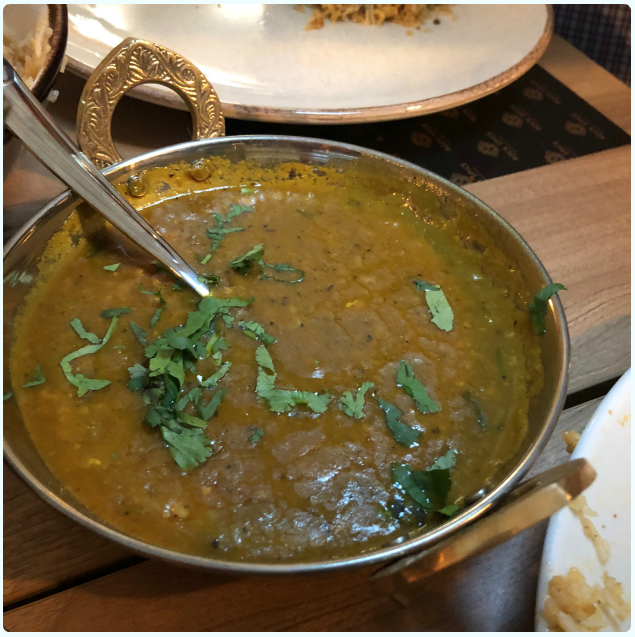 We were given lots of dishes to try, which the team felt showcased what they had on offer. Apologies in advance for the poor lighting, we were not in a photo friendly spot! I'm sure you'll get the gist though. 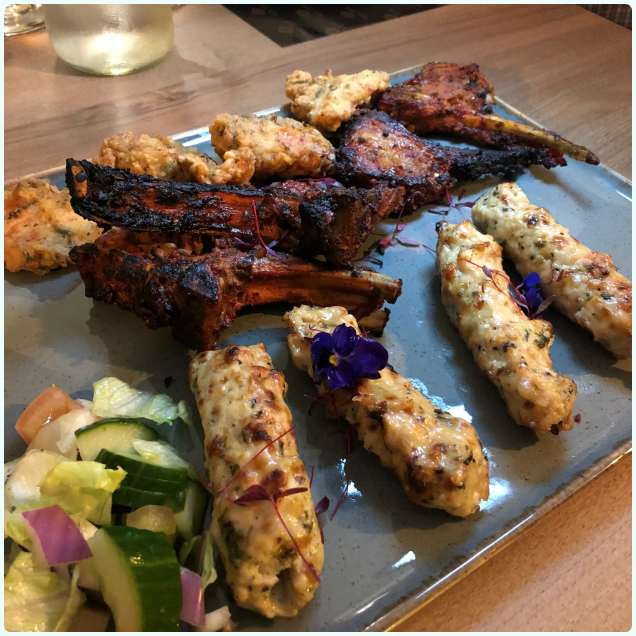 Tandoori fish and vegetable canapés: Lovely bitesized pieces of white fish or vegetables covered in tandoori style spices, with tamarind and mint dips. Perfect with a glass of fizz. I'm not even going to lie, our table ate a lot of these. 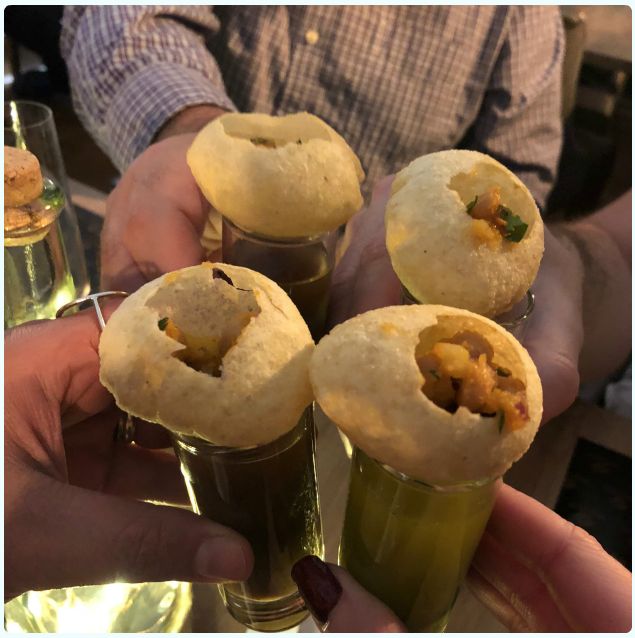 Golgappas topped with panipuri: It was very unclear what was going on here. 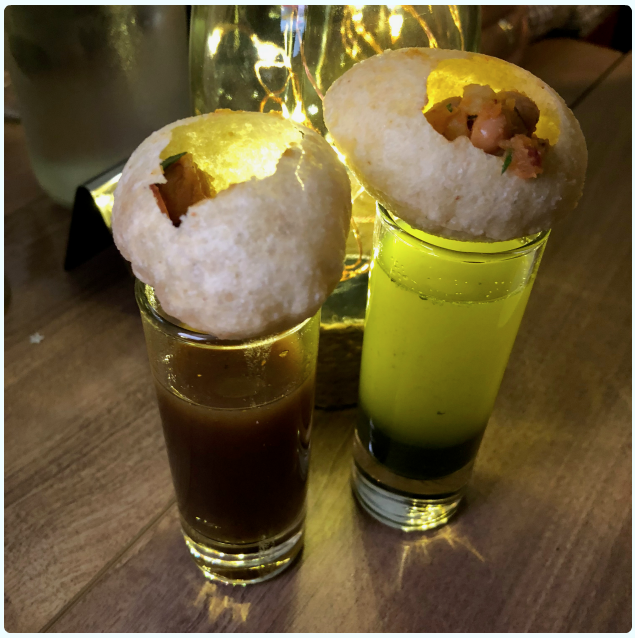 One was mint, the other was 'spicy', both had a little panipuri on the top, filled with spicy onions. Jeez Louise these packed a punch! A little strong for me, but a fun concept which got the table talking. They are hot dammit. Between courses, the delightful Harry Robson (fresh out of Hogwarts) was entertaining us with some magic tricks. I'm the first to say I hate table magic, and most magicians in general, but Harry is a right little diamond. He brings humour and some really clever tricks. Met with a table of over-thinkers and hand watchers, he managed to baffle us all by getting Simon's card into a sealed envelope. You're a wizard Harry. Mixed grill platter: I'm pretty sure this is the Bolton influence in this 'fusion' style of cuisine. A big platter of meat which was very well received at this stage, as we were mightily peckish. My highlight was the charred spicy lamb chop. 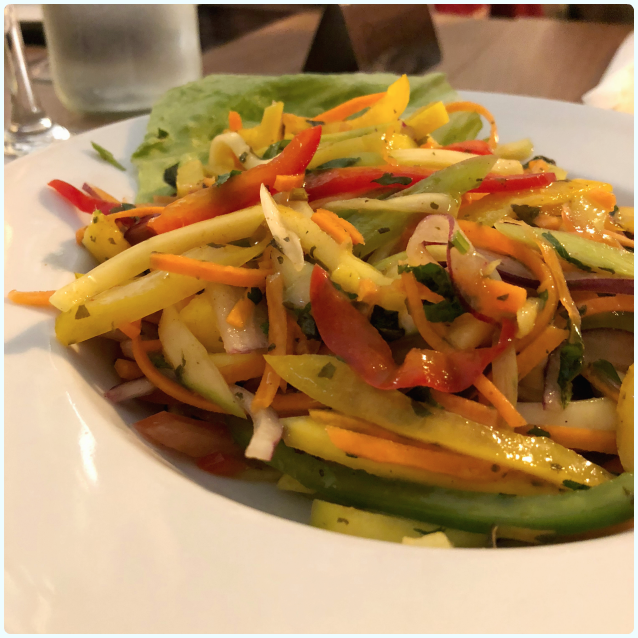 Mixed pepper and mango salsa: Who even knew that I'd be sat here raving about a salad? This was absolutely delicious. Shards of tricoloured peppers with ribbons of carrot, mango and coriander. I could have eaten this whole platter. I want this with every curry from now on. A real star of the show considering it was something so simple. 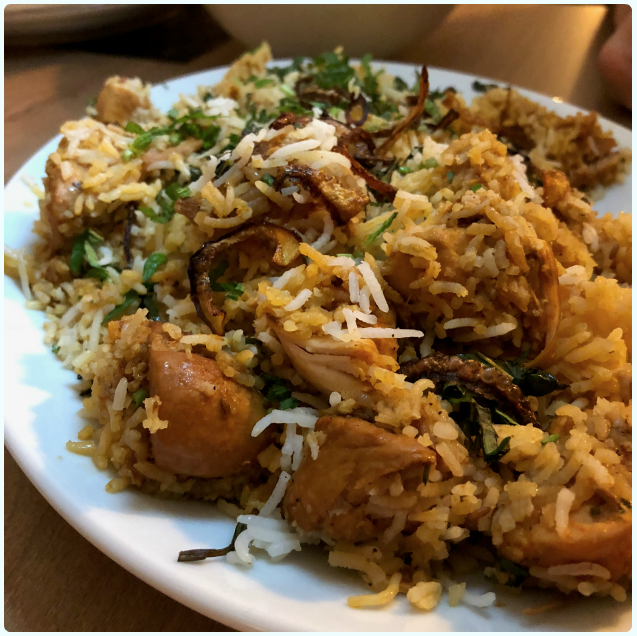 Chicken biriyani: God bless the arrival of carbs. My cousin's wife is from Pakistan (special mention to Sakba), and makes the best chicken biriyani. Very few come close, but I have to say this was pretty near. The chicken was well marinaded, and the rice had taken on rich flavours from the cooking liquor. Channa masala: Lifelong carnivore, absolutely loving this dish. The only one that we ate every scrap of. Cooked down to perfection, this was best paired with fluffy naan bread. Could just have this now. Furious. 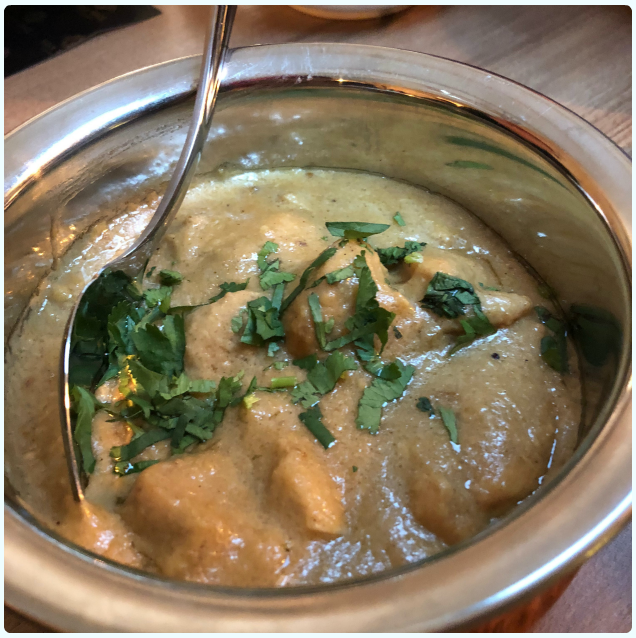 Chicken afzaa: A pleasant creamy dish, which I expected to taste like a korma because of its colour. It was actually nowhere near as sweet, yet still very creamy. 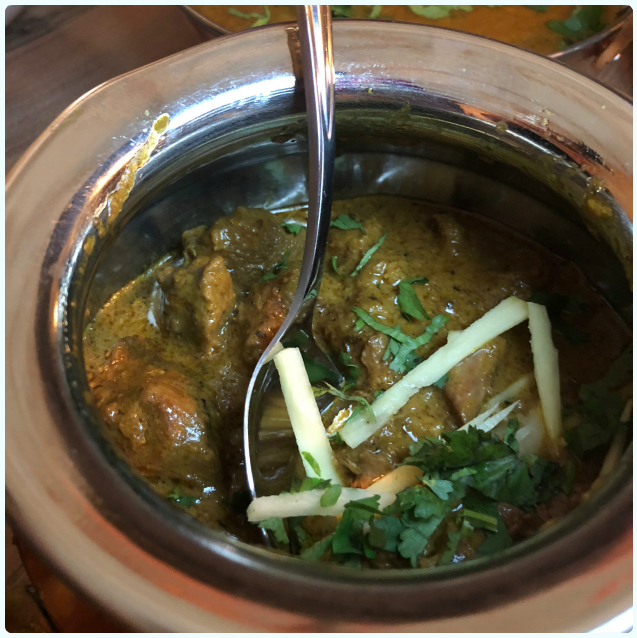 Lamb karahi: Tender slow-cooked lamb in a thick, fragrant sauce. Great with rice. It was nice to see three very different sauces showcased over the variety of curry dishes. 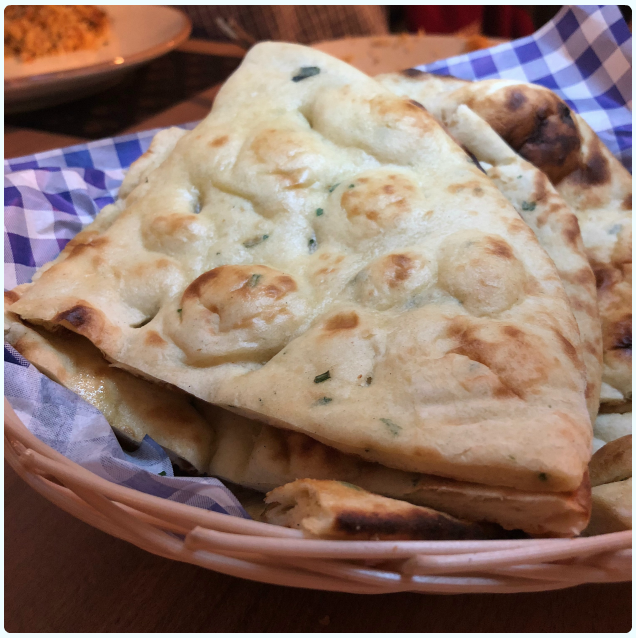 Garlic butter naan bread: The lovely fluffy variety, rather than the type where the edges are like toast. The addition of melted butter infused with garlic kept them wonderfully moist too. Perfect for dipping in those sauces. The chefs at Rock Spice had a lot of people to serve on Friday, all on the same sitting. Much respect to the kitchen, who managed to turn out great food which was fresh and piping hot throughout the night. Evenings spent eating lots of tasty food, catching up with friends, and sipping bubbles are the best type. 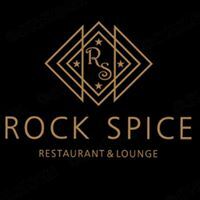 Huge thanks go to Caroline and the Rock Spice team for our invite, and a very pleasant evening indeed. Disclaimer: This was a free press event. I was not coerced into saying nice things, and to the best of my knowledge, no spells were put on me by Harry in order to sway my judgement. I just really like curry.